Visual representation allows students to access, break down and understand complex GCSE word problems. 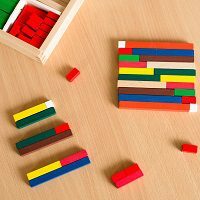 These techniques can also be used to develop an understanding of many areas of mathematics from number structures to solving equations and completing the square. They are effective at all levels of secondary school in terms of developing an understanding of mathematics. train secondary teachers in the use of array and bar models to a standard so that representation techniques can be shared with colleagues and disseminated through the department. What is involved: The Work Group will comprise 2 sessions 9.30-3pm. Delegates will receive supply cover funding of £200/ day to attend the sessions. Funding: Our DfE grant, via the NCETM, allows BBO Maths Hub to provide this training free-of-charge to delegates. In addition, delegates will receive supply cover funding of £200/ day to attend the sessions.